This American cosy is the third Myrtle Clover mystery. Though in her eighties, Myrtle is fit for fight. The local book club has stagnated, and Myrtle is not pleased with their diet of bland beach books so something must change. 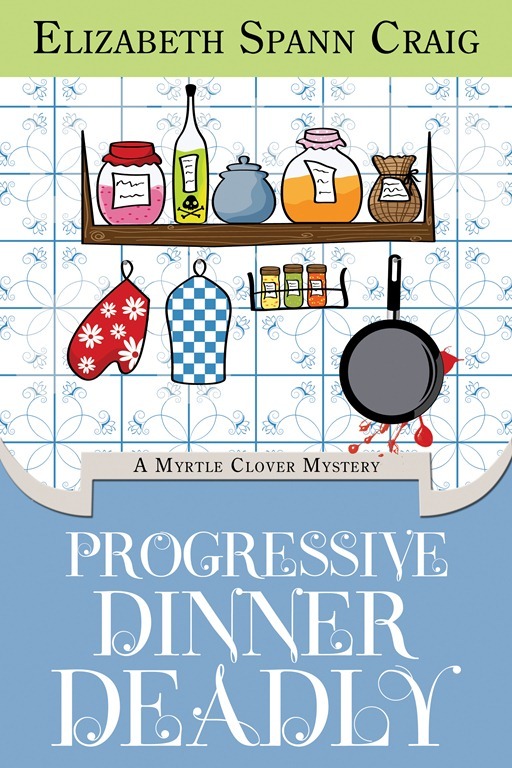 Myrtle is not the only one who has plans for the club, however, so before she and her ally Miles have a chance to unfold their ideas for a literary club, everybody else has turned it into a progressive dinner club. Grudgingly Myrtle accepts her defeat, and during the frantic preparations for the first night we get to know all the generous women of Bradley, California, and we can begin to wonder how they have survived so many conflicts and embarrassing secrets for so long. Obviously their premiere must end in murder, and when Myrtle happens to tell her troublesome neighbour Erma Sherman that she is on the verge of discovering who did it, the editor of the Bradley Bugle puts the story about the aged detective on the front page. Now Myrtle is forced to solve the case to save face. Her son Red, the local chief of police, reacts with a mixture of anger and over-protectiveness, but no matter what he does, he cannot keep Myrtle and the various suspects apart. A very fine cosy mystery, and one of my favourite characters, the vicious cat Pasha made me laugh out loud more than once. No, don´t worry, this is not a speaking Disney character, just an animal with a bit of personality. So my only complaint is that the story was over far too soon. I bought the Kindle edition myself – a real bargain! This entry was posted in American, cozy mystery, Elizabeth Spann Craig, review, review 2011. Bookmark the permalink. Dorte, thanks so much for this lovely review! I’m so glad you enjoyed the book. 🙂 I always have a lot of fun with Myrtle and her crew…and Pasha the feline, who insisted on being written. Thanks! How did I miss a book!? I thought this was only the second Myrtle mystery… Oh well, I’m reading it now too. I like Myrtle a lot. I’m like Clarissa – I somehow missed the second book! Guess I need to make a visit to Amazon. Dorte, I just ordered a Kindle today and maybe this series will be my first excursion into Kindle reading – after I read your new book and Linda Gillard’s! This protagonist sounds like just my cup of tea. Elizabeth: It was a genuine pleasure to meet Myrtle again. Kelly: I wish you luck, but the first one is very difficult to come by. Barbara: she really is a plucky old lady (but don´t tell her I called her old). You need a “danger ahead” sign — when you post about cozies, my wallet is in big trouble.